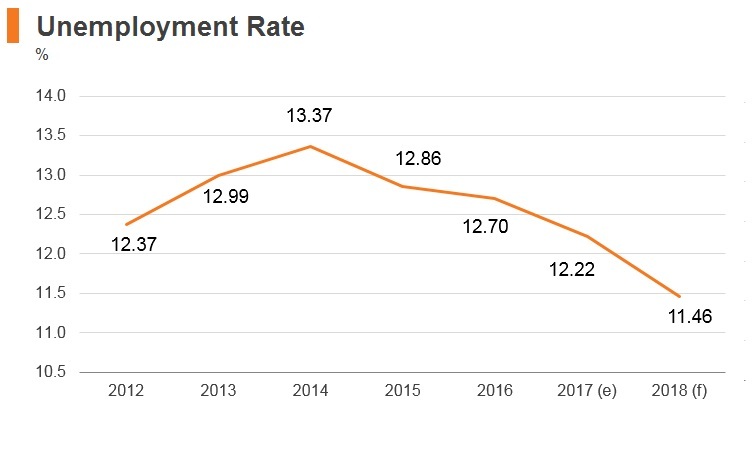 The Egyptian government has been implementing a series of transformational reforms which, along with the gradual restoration of confidence and stability, are starting to yield positive results. To alleviate adverse short-term effects of reforms on the poor, there has been an upscale in key social protection measures, including more poverty-targeted programmes. However, despite government efforts, social conditions remain difficult due to high inflation and erosion of real incomes. The ability of the private sector to create jobs is, therefore, critical to reap the benefits of the reforms and mitigate the impact on vulnerable populations. 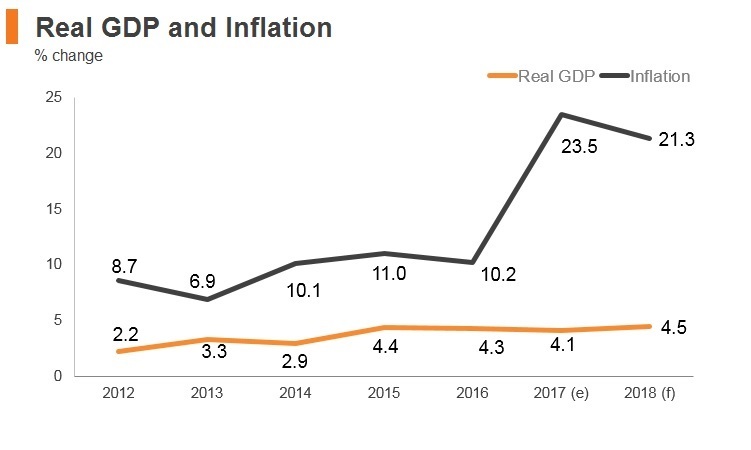 Going forward, the economy will continue recovering over the medium term, as growth increases and the budget deficit decreases. Egypt announced that it would hand over to Saudi Arabia two strategic Red Sea islands. President Abdel Fattah el-Sisi announced that the Central Business District (CBD) being built in the country’s New Administrative Capital would be completed in two years. 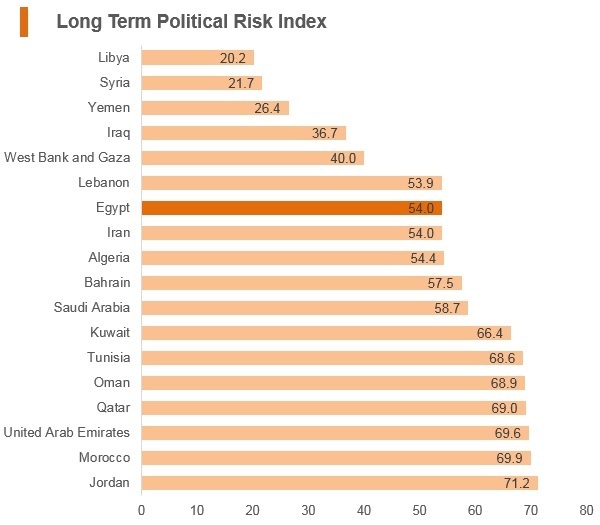 Egypt has gradually moved towards a more liberal trade regime. It became a member of the World Trade Organisation (WTO) in 1995, and revamped its tariff regime in 2004 as agreed in its accession agreement. Egypt participates actively in the multilateral trading system, both in the regular work of the WTO and in the Doha Development Agenda negotiations. It grants at least most favoured nation (MFN) treatment to all WTO Members. Egypt is a party to the Agreement on Trade in Civil Aircraft, and to the Information Technology Agreement (ITA), but not to the Agreement on Government Procurement (GPA). In June 2017, Egypt ratified domestically the Trade Facilitation Agreement (TFA), but has still to submit to the WTO its instrument of acceptance of the Agreement. Egypt’s simple average applied MFN tariff rate was 19.1% in 2017, slightly down from 20% in 2005, but higher than 16.5% in 2012. Some two-thirds of all tariff lines face rates of 10% or lower. The 51.6% average tariff in agriculture reflects tariff peaks for alcohol and tobacco, which can be as high as 3,000%. 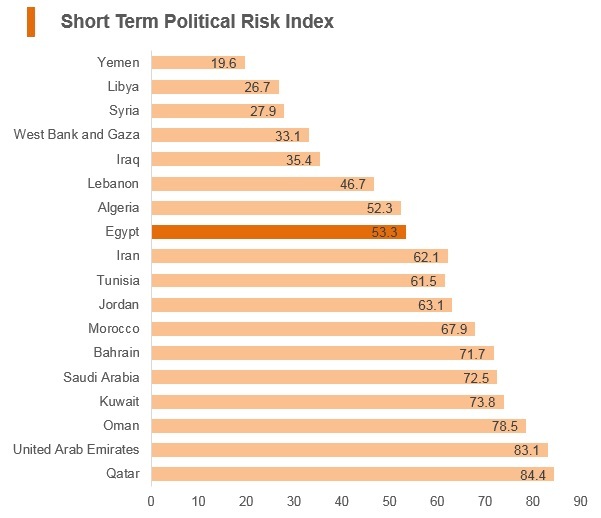 Egypt has bound 99.3% of its tariff lines; the general simple average bound tariff is 37.2%. In 2017, some 46 lines exceeded their bindings. All tariff rates are ad valorem, with the exception of 21 lines. In addition to tariffs, imports are now subject to a value-added tax of 14%, which also applies to domestically produced goods; exported goods are exempted and services are zero-rated. Egypt also applies excise taxes on some products in addition to the general VAT rate. Egypt’s trade policy objectives are set out in the Industrial Development Strategy (IDS) for 2016-2020, in accordance with Egypt’s SDS “Egypt Vision 2030”. The aim is to help Egypt become a leading industrial economy in the Middle East and North Africa region and a main export hub for medium-technology manufactured products by 2025. The IDS covers the following areas: industrial development for micro, small and medium enterprises (MSMEs); export promotion and import rationalisation; innovation promotion; energy conservation; the development of technical and vocational education; and improvement of the business climate. The main goals are to accelerate industrial growth, increase the contribution of MSMEs to GDP, spur export growth and create productive jobs. As a measure designed to protect the local automotive industry, imported vehicles are subjected to a tariff ranging from 40%-135%, depending on the engine size. Vehicles with engines over 2,000cc are subject to an additional sales tax of up to 45%. 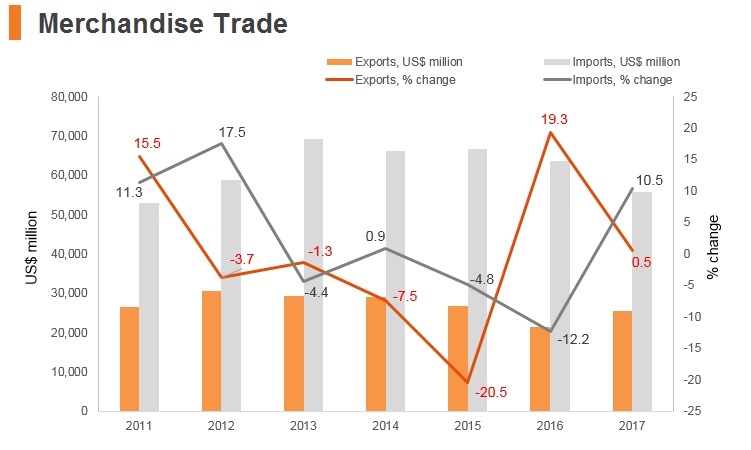 The Presidential Decree 25 of 2016 also significantly increased import tariffs on a wide range of products such as household appliances, electronic devices, clothing, shoes, watches and some agricultural produce. Egypt requires proper labelling for imports of food products. All food products should be packed in appropriate packages, which should be clean, intact, and odourless so as to preserve the products and not affect its characteristics. Egypt has continued its reform process, with a view to making its customs administration more efficient and transparent, by reducing the number of documents required for import and export processes and allowing their presentation electronically. Some changes have already been introduced to facilitate trade. These changes include activating the Authorised Economic Operator (AEO) system, introducing x-ray devices in most customs posts to facilitate customs control and reduce release times, and implementing an e-freight import and export system for air freight. A Ministerial Steering Council for Egyptian Trade Facilitation (EgyTrade) has been established, aiming at the creation of an Egyptian National Single Window (ENSW) system. A number of products are subject to quality control inspections when imported. Additionally, the importation of a relatively large number of items is subject to special conditions and requires a licence, including cars, shoes, textiles, car parts, certain food products such as milk and other consumer goods. Egypt has accepted the WTO Code of Good Practice for the Preparation, Adoption and Application of Standards. Technical regulations are issued by the different ministries. As at December 2016, Egypt had in place some 860 technical regulations covering five sectors, with the largest number pertaining to engineering and chemical products, food, textiles and measurement products. All imported goods subject to technical regulations are inspected to verify conformity with each regulation. The Egyptian Accreditation Council (EGAC) is the sole national body for the assessment and accreditation of conformity assessment bodies and laboratories in Egypt performing testing and calibration, inspection, and certification activities for products, systems and personnel. 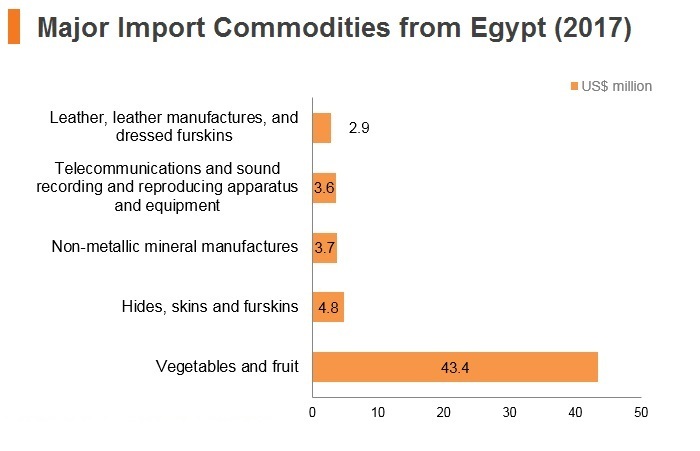 Egypt is a relatively active user of trade remedy measures: between January 2005 and June 30, 2017, it initiated 31 anti-dumping investigations, 16 of which resulted in the imposition of definitive anti-dumping duties. Three anti-dumping measures were extended. 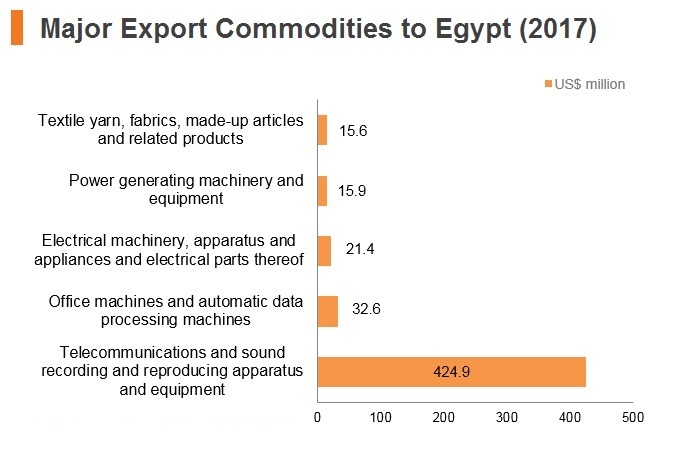 During the same period, Egypt initiated 14 safeguard investigations, imposed provisional measures in all and final safeguard measures on three products: blankets, steel rebar, and cotton and mixed yarns. There are currently no countervailing measures in place. 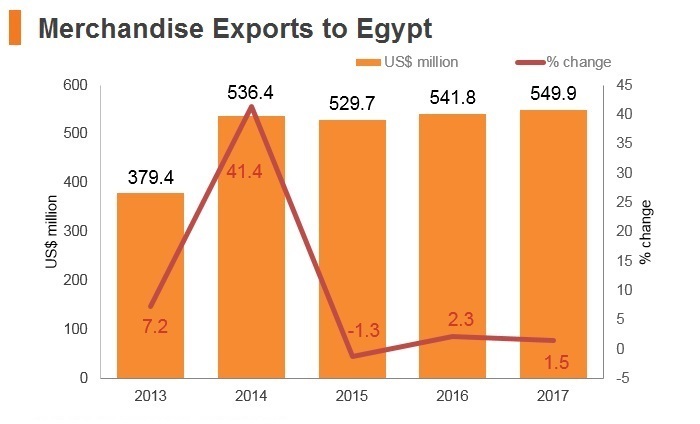 Egypt imposes export taxes on a number of products, including sugar, waste plastic, some fertilisers, fish, sand, some skins, marble, and raw granite, among others. Egypt introduced an export tax on sugar for an unlimited duration effective March 2017. There are various controls and inspection procedures for food products, live animals, and animal and plant products, implemented by the corresponding responsible agency. Importers of plants must obtain an import permit prior to importation and are also required to notify the exporting trading partner of the corresponding import regulatory requirements, which are set according to the potential risk associated with pests. Imports of live animals require an import permit from the Central Administration of Veterinary Quarantine. Importers of meat products and chicken must provide a number of certificates before the product is accepted, including a slaughter certificate proving that the animal was slaughtered in accordance with the Islamic ritual (halal), a veterinary certificate and a certificate of origin. Egypt is a member of most of the main international treaties on intellectual property rights (IPRs). The Intellectual Property Law No. 82/2002 is a unified Law that covers the major areas referred to in the TRIPS Agreement. There are no provisions in Egypt’s IPR legislation that expressly allow or prohibit parallel imports. According to the authorities, Egypt’s IPR policy recognises the importance of IPR protection as a key factor in economic growth and development. The enforcement of IPR legislation is handled by various specialised authorities, some of which are entitled to act ex officio regarding IPR crimes. Border measures may be applied on all forms of intellectual property. Besides the Association Agreement with the EU, Egypt has signed a number of free trade agreements (FTAs) to help Egyptian exports gain preferential access to markets of the signatories. Such FTAs include the Greater Arab Free Trade Agreement (GAFTA, with 17 members including Egypt), the Common Market for Eastern and Southern Africa (COMESA, with 19 members including Egypt), the Agadir Agreement (with Egypt, Morocco, Tunisia and Jordan as members), plus the MERCOSUR-Egypt FTA (with Argentina, Brazil, Paraguay and Uruguay). Egypt has also signed bilateral trade agreements with Lebanon, Syria, Morocco, Tunisia, Libya, Jordan and Iraq. Egypt also offers improved market access to least developed countries (LDCs). Egypt also participates in the Framework Agreement on the Trade Preferences System of the Organisation of Islamic Cooperation (TPS-OIC), which is still to enter into force. Egypt is also negotiating trade agreements with various countries and regions, including Nigeria, Tanzania, India, Sri Lank, Russia, the West African Economic and Monetary Union (UEMOA) and the CEMAC Group (including Cameroon, Central African Republic, Chad, Congo, Gabon and Equatorial Guinea). Egypt enjoys Generalised System of Preferences (GSP) status provided by Australia, Canada, Japan, Kazakhstan, New Zealand, Russia, Turkey and the US. Preferential tariff and duty-free treatment on certain items are granted to Egypt by these countries. The Tripartite Free Trade Area (TFTA), was officially launched in Egypt in June 2015 with an estimated finalisation date of 2025. This agreement is aimed at bringing together three of Africa's major regional economic communities: Southern African Development Community (SADC); East African Community (EAC) and COMESA. Out of 26 members, as of June 2018, only 22 countries had signed the agreement. It will enter into force once it has been ratified by at least 14 member states. So far only Egypt, Uganda, South Africa and Kenya have ratified it. Greater Arab Free Trade Area (GAFTA), comprising Algeria, Bahrain, Iraq, Jordan, Kuwait, Lebanon, Libya, Morocco, Oman, Palestine, Qatar, Saudi Arabia, Sudan, Syria, Tunisia, United Arab Emirates and Yemen. 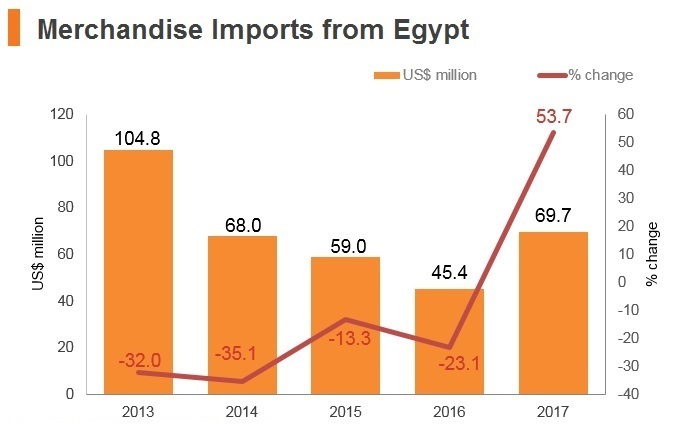 Egypt is party to this bloc and the other member states are important trade partners and the reduction or elimination of tariffs has eased trade flows. EU-Egypt Association Agreement: in force since 2004. This creates a free-trade area between the EU and Egypt by removing tariffs on industrial products and making agricultural products easier to trade. EU-Egypt trade has more than doubled from EUR11.8 billion in 2004 to EUR27.9 billion in 2017. 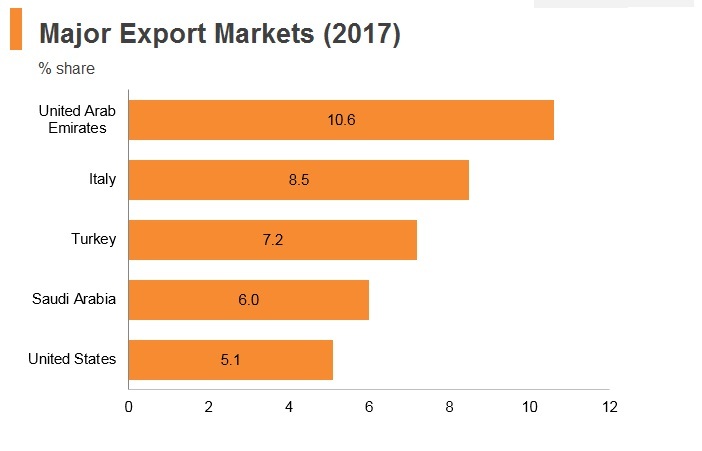 The EU is both Egypt's biggest import and export partner, covering 29.7% of Egypt's trade volume in 2017. In June 2013 the EU and Egypt began discussing how to deepen their trade and investment relations through a Deep and Comprehensive Free Trade Agreement (DCFTA). A future DCFTA would aim to improve market access and the investment climate. It would also support Egyptian economic reforms. It would extend beyond the Association Agreement to include trade in services, government procurement, competition, intellectual property rights, and investment protection. 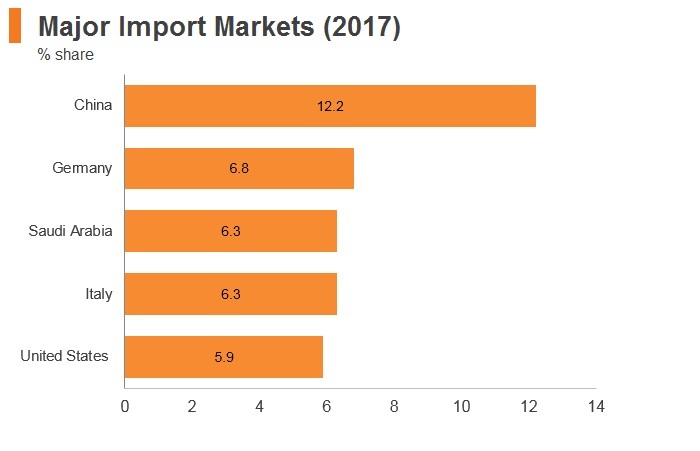 COMESA: This comprises Burundi, Comoros Islands, DRC, Djibouti, Eritrea, Ethiopia, Libya, Madagascar, Malawi, Mauritius, Rwanda, Seychelles, Sudan, Swaziland, Uganda, Zambia and Zimbabwe. Not all members subscribe to the free trade area, and trade flows with other African states remain lower than with Europe, the Middle East and Asia. There is upside potential for intra-African trade with the prospects of a regional trade agreement brightening. Egypt-Turkey FTA: Turkey is an important trade partner, providing a key source of refined fuel and a market for textiles. This FTA between the Republic of Turkey and the Arab Republic of Egypt was signed on December 27, 2005 in Cairo and entered into force on March 1, 2007. With the Turkey-Egypt FTA, tariffs and non-tariff barriers were eliminated in trade between the states. The agreement also covers numerous trade-related areas such as the sanitary and phytosanitary measures, trade in services, foreign direct investments, internal taxation, balance of payments, public procurement, state aids, intellectual property rights, anti-dumping and safeguard measures and rules of origin. Customs duties applied by Turkey on industrial goods originating in Egypt have been abolished by the entry into force of the Agreement. On the other hand, customs duties applied by Egypt on the industrial goods originating in Turkey will be abolished gradually until January 1, 2020, according to the lists provided in Protocol I of the Agreement. Regarding agricultural products, Turkey and Egypt granted each other unlimited tariff elimination and/or tariff reduction or elimination of tariff quotas for some agricultural products originating in the other party. The agricultural products that are subject to tariff reduction or elimination are listed in Protocol II of the Agreement. Egypt-US: The United States and Egypt cooperate on trade under the bilateral Trade and Investment Council. The Council, established under the July 1999 Trade and Investment Framework Agreement (TIFA), discusses ways to further expand fair and reciprocal trade and investment between the two countries. The US is a top trade partner and tariff-free access would provide a boost to Egyptian exporters. Working groups have been established on customs administration and reform, government procurement, Sanitary and Phyto-sanitary (SPS) issues and agricultural tariff issues. Egypt-Israel: Under the US umbrella, Egypt signed a trade protocol with Israel on December 14, 2004. The protocol establishes what are called ‘qualified industrial zones’ in Egypt. Products from these zones will enjoy duty-free access to the United States, provided that 35% of their components are the product of Israeli-Egyptian cooperation. MERCOSUR-Egypt FTA: In 2010, the MERCOSUR (Southern Common Market) signed an FTA with Egypt. 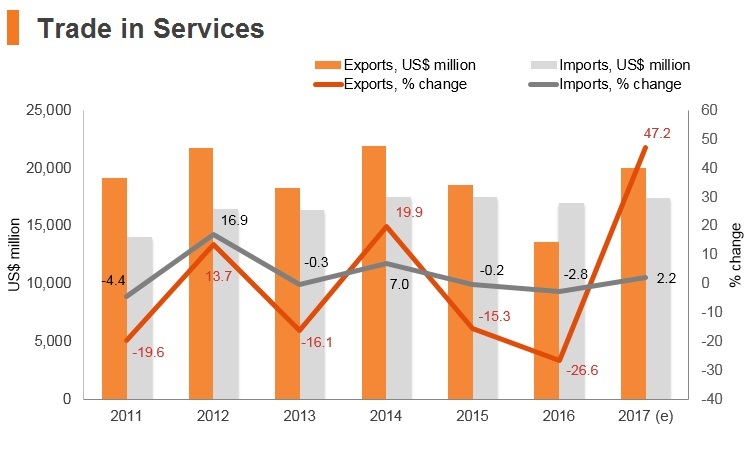 Trade with Latin America is relatively low, and despite potential for expansion, closer markets in Europe and Asia will remain the major trade partners. Mercosur is an economic and political bloc comprising Argentina, Brazil, Paraguay, Uruguay and Venezuela. 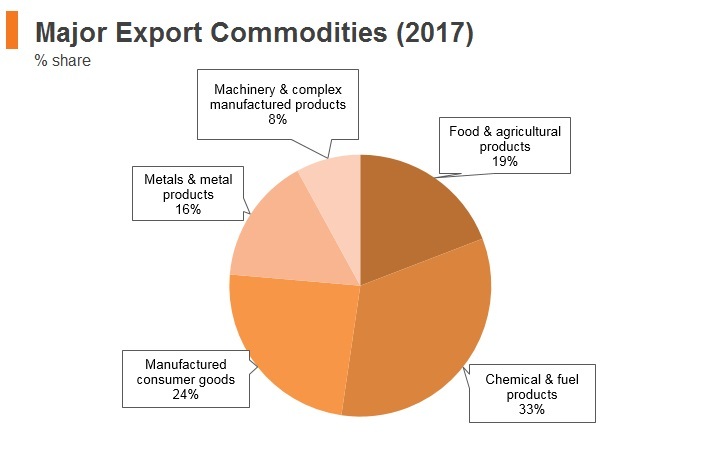 Products exported from Brazil to Egypt that will reap the immediate benefits of this agreement include beef products, cereal, ores and inorganic chemical products, while Egyptian exports covered by the agreement will include both organic and inorganic fertilisers, vegetables, cotton and textiles. Egypt is reliant on external financing and foreign aid to drive its economic development. In April 2015, France signed contracts worth USD1.5 billion with Egypt on various transport and electricity projects. President el-Sisi is actively courting aid and investment from Asia, including China, Japan and Korea. In January 2016, China announced loans of USD1.7 billion to Egypt alongside USD15 billion of energy, infrastructure and construction projects in Egypt awarded to Chinese companies. In addition to seeking an IMF loan of USD12 billion, Egypt signed a currency swap deal with China for about USD2.6 billion in December 2016 to pop up its official reserves. The European Union is the main foreign investor in Egypt, followed by the United States and some Arab countries. There are provisions that allow the granting of a residence permit to foreign investors throughout the term of their investment projects in Egypt, as well as fair treatment to both foreign and Egyptian investors. Investors also maintain the right to repatriate profits and receive international finance without any restrictions. Ratified in June 2017, the new law includes a chapter on investment in technological zones, which will provide dedicated support to businesses working on the design and development of electronics, data centres, outsourcing activities, software development and technological education. Businesses located in the hubs are eligible for tax and customs duty exemptions on the tools, supplies and machinery that they require for their operations. Technology investors will also be covered by other guarantees and incentives featured in the legislation - which is aimed at bringing about a more robust legal environment for foreign businesses - including guaranteeing equitable treatment of foreign and local investors and the right to export the investment project's products without needing to sign up with the Exporters Registry. Under the new investment law, investors also have the right to directly import raw materials, equipment, spare parts and/or transportation means as necessary for investment projects without registering with the Importers Registry, which can help lower start-up costs. Once operational, investors also have the right to export the investment projects' products, whether directly or indirectly, without registering with the Exporters Registry. 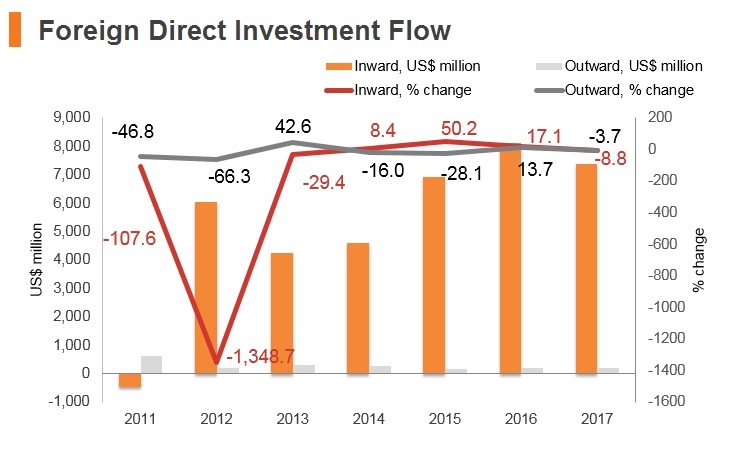 The application of a unified custom duty at a flat rate of only 2% of the value of any equipment, machinery and devices that are necessary for the establishment of infrastructure and investment projects is a positive boost to foreign investors. Furthermore, the law provides exemption from the custom duty that is imposed on importation of some tools for temporary use on industrial projects and to be re-exported afterwards. There are a total of 10 free trade zones in Egypt: Cairo (Nasr City), Alexandria, Port Said, Suez, Ismailia, Damietta, Media, Shebin El-Kom, Qeft and Port Said East Port. Goods exported from or imported into the free zones are not subject to normal import/export customs procedures, duties or other taxes and fees. Likewise, all instruments, machinery, equipment and transportation equipment necessary for establishments authorised within the free zones are exempt from customs and duties. New regulations for the establishment of free zones are contained in the new investment law, Law No. 72/2017. The incentives offered in free zones are meant primarily to attract investment, to provide employment for Egyptians and to encourage exports. There are two types of free zones: public and private. Public free zones are established for several projects, whereas private free zones are confined to one specific project or company, and must meet certain conditions, inter alia with respect to minimum capital (USD10 million) and exports (they must amount to no less than 80% of the production value). Enterprises in free zones benefit from complete exemption from import tariffs, income taxes and VAT. However, they charged a fee of 1% or 2% in lieu of taxes. Free zone investors may sell all or part of their products on the Egyptian market after payment of the relevant customs duties. There are currently nine public free zones in operation. 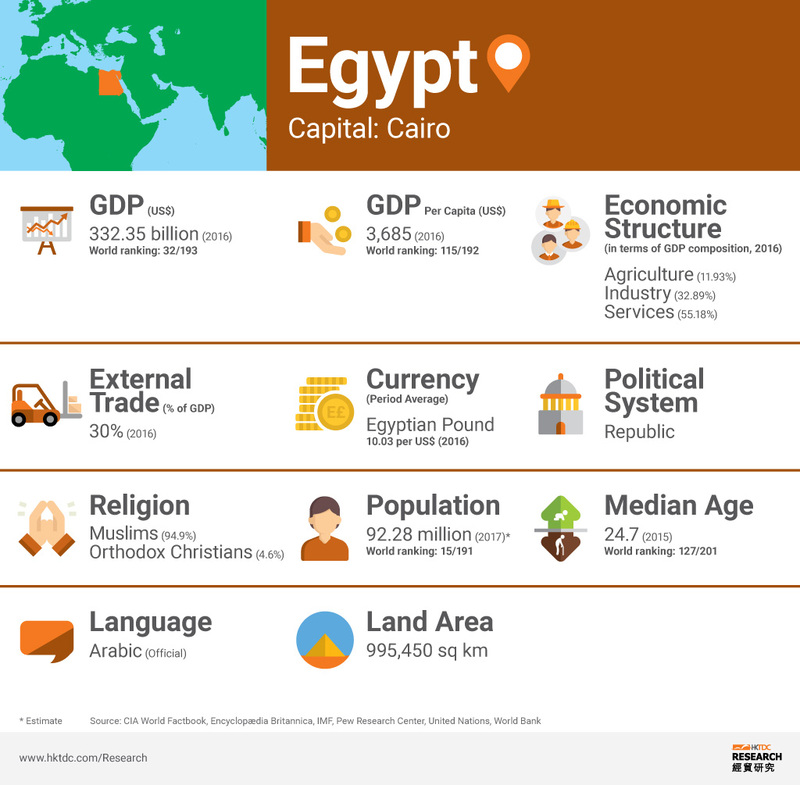 Egypt also has one Special Economic Zone, which benefits from special and simplified customs procedures, tariff-free imports of inputs and equipment, and lower taxes. Free zones can be established in the form of public or private free zones by virtue of a decree mainly for the exportation purpose. Free zones can be established in all investment sectors except for oil and liquidation or production of natural gas, fertilisers and steel production; transportation; alcohol production; 'heavy energy usage industries' as specified by the Supreme Energy Council; weapons and explosive production; as well as any other products related to national security. All products imported or exported by the investment projects inside any of the free zones, with few exceptions, will not be subject to the importation and exportation regulations applied outside of them, or custom duty or any other tax. 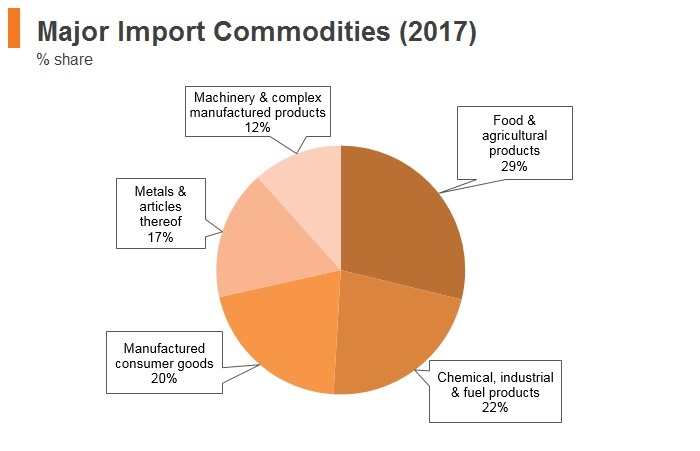 Nevertheless, these investment projects are required to pay 2% of the aggregate value of the imported products for storage projects (with the exception of transit goods), as well as 1% of the aggregate value of the exported products (FOB) for production projects and 1% of the aggregate income for any investment project that is not involved in importation or exportation. The allocation of plots of lands free of charge for strategic business activities is also available. The prime minister can also grant a refund of 50% of the value of any plot of land that is allocated to industrial projects, as long as the operation thereof takes place within two years from the time when the land is allocated. Egypt implements a number of incentives programmes, which can be general or sector-specific. There are also regional support programmes, and programmes for MSMEs, which include facilitating access to credit at preferential conditions. There are currently 13 investment zones specialised in various fields; they enjoy the same benefits as free zones in terms of facilitation of licence issuance, but are not granted tax exemptions. A new governmental agency was created in 2017 to provide support to MSMEs. Competition policy is mainly regulated by the new Constitution of 2014, and the Egyptian Competition Law of 2005, its Executive Regulations and their amendments. The Competition Law sets out prohibitions in respect of the abuse of a dominant position and provides a list stating nine different prohibited acts. It also prohibits vertical agreements or contracts between a person and its supplier or clients if they are intended to restrict competition. Recent amendments to the Competition Law gave the Egyptian Competition Authority (ECA) the power to initiate criminal lawsuits and to settle with violators, and in general strengthened its enforcement faculties. Between its inception in 2006 and April 2017, the ECA completed 109 investigations, 37 studies and 13 advisory opinions. During this period, the ECA proved 36 violations of the law, 28 of which were during the 2012 - 2016 period. 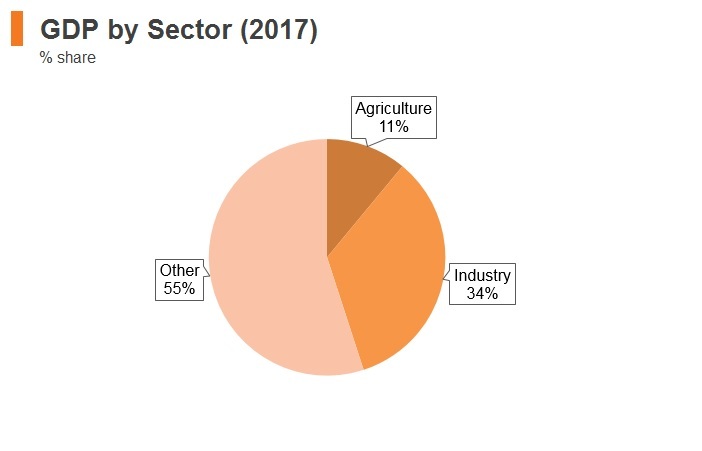 The presence of the state in the economy is important in Egypt, which has about 150 state-owned enterprises engaged in activities in a number of sectors, including petroleum, transportation, telecommunications, post and industrial activities. Three state-owned banks own some 40% of the banking sector’s assets. Egypt is pursuing its efforts to solve the electricity supply crisis by raising electrical generation and distribution capacity through a combination of new investments and of regulatory reforms, opening and partially unbundling the sector. Egypt has adopted a number of measures to promote renewable energies and to facilitate public-private partnerships in them. The financial services sector is well supervised and open. 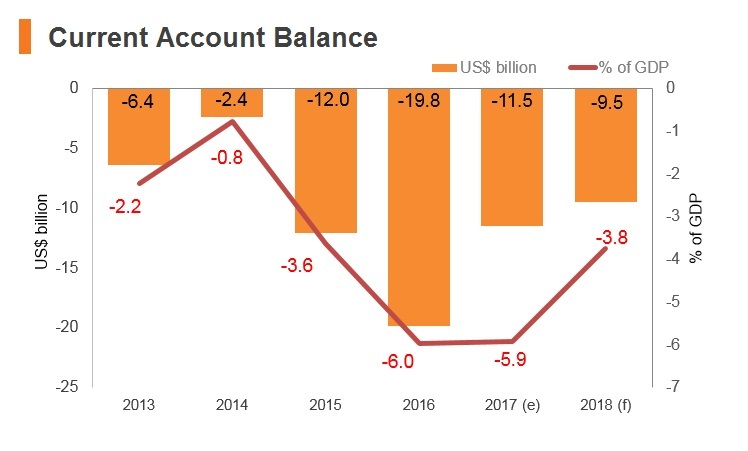 Egypt has a large banking sector, though during the period under review, the number of banks has declined somewhat as Egypt has not delivered any new banking licences since 2009. Banks, both domestic and foreign-owned, must register with, and obtain a licence from, the Central Bank of Egypt. A number of conditions must be met prior to registration, including a minimum capital requirement of USD50 million for a foreign bank branch. There are no legal limitations to the number of licences that can be granted, but there is a policy of consolidation of existing banks. Licences are open-ended. Maritime transport is the main means of transportation used for Egypt’s international trade. Cabotage in maritime transport is reserved for national flag carriers. However, waivers can be granted to foreign vessels to practise cabotage in case of the breakdown of an Egyptian vessel and when a supplier terminates its service. The bilateral and plurilateral agreements signed by Egypt do not grant any reciprocal preferential treatment to partner states for cargo sharing. There are no restrictions on the exercise of onshore maritime transport activities and auxiliary services (except for maritime agency services). There are no foreign ownership restrictions for cargo handing/maritime terminal activities or for specialised ports. Egypt grants no preferential treatment for national flag vessels’ access to ports and port services. 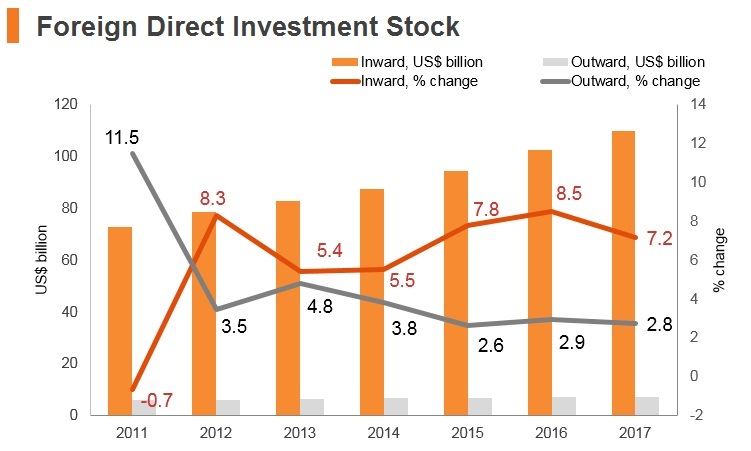 The passage of a new investment law in 2017 provides a wide range of tax breaks, rebate incentives and more streamlined administration processes, thereby allowing foreign investors greater flexibility and transparency. In the new investment law there are also provisions for tax reductions of up to 80% of the paid-in capital from the starting date of the investment projects in Egypt for seven years that are applied at different rates (subject to the issuance of the Executive Regulation of the New Investment Law). The first rate of 50% of the investment costs applies to investment projects that will be established in the geographic locations most in need of development as determined by the authorities. The second rate of 30% of the investment costs applies to investment projects located anywhere in country as long as they are involved in highly labour-intensive projects and projects focused on small and micro enterprises (and these are intended to have the twin effect of lowering unemployment and growing local industries). This special provision also applies to projects producing new and renewal energy and electricity distribution networks, national and strategic or tourism projects, export-orientated projects, automotive production and its supporting projects, chemicals, food, pharmaceuticals, mineral, textile and leather production, engineering, as well as management of agricultural waste. The prime minister may also grant additional incentives such as the establishment of a special customs gates for imports and exports related to an investment project, including some training costs. The Egyptian government encourages investments in sectors that create employment, generate foreign exchange and create forward and backward linkages with rural areas. Labour regulations continue to restrict the employment of foreign nationals, particularly in low-skilled sectors. Labour rules prevent companies from hiring more than 10% non-Egyptians (25% in Free Zones), and foreigners are not allowed to operate sole proprietorships or simple partnerships. Work permits are required for all foreign nationals intending to work in Egypt. A foreign national must obtain a work permit to be able to stay and work in Egypt. In 2011, Egyptian authorities enacted regulations designed to restrict access for foreigners to Egyptian worker visas, particularly for low-skilled labour. Visas for unskilled workers will be phased out. For most other jobs, employers may hire foreign workers on a temporary six-month basis, but must also hire two Egyptians to be trained to do the job during that period. Only jobs where it is not possible for Egyptians to acquire the requisite skills will remain open to foreign workers. The procedures are easier for managers than employees. A joint stock company or a limited liability company operating under the umbrella of the Investment Law can appoint a number of managers commensurate to the value of its capital. It usually takes around two months from application to obtain a residency visa, and it costs around EGP3,000. 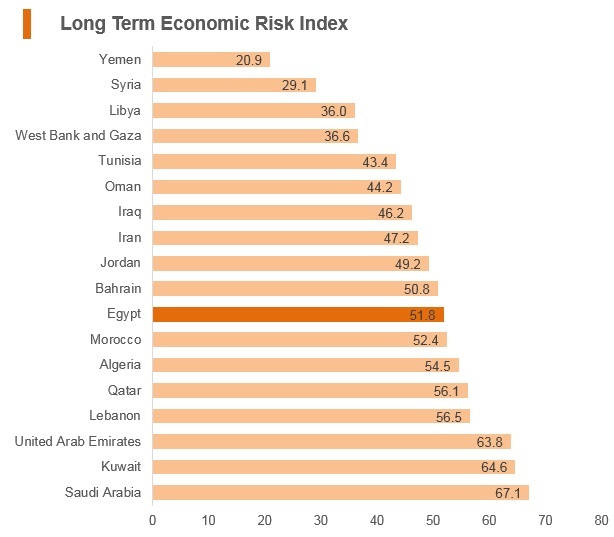 Egypt has numerous inherent advantages that make its long-term growth story compelling. These include a strategic geographical, political and cultural position in the region, a large and growing working-age and consumer population, a strong infrastructure project pipeline and a well-developed financial sector. Furthermore, the underdeveloped private sector combined with the progress of structural economic reforms provides ample room for expansion through value addition. 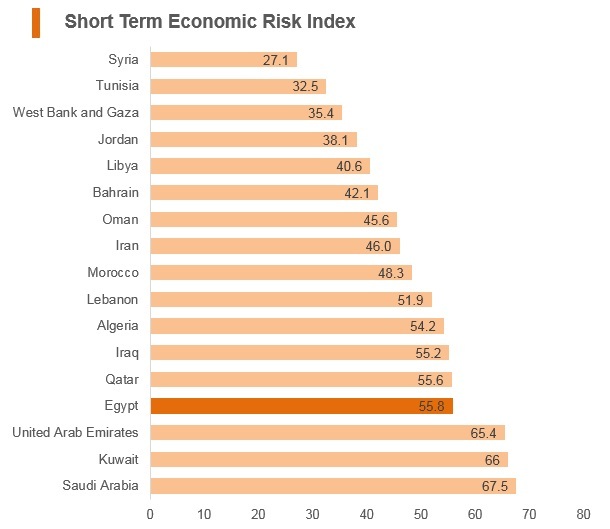 However, Egypt's operating environment holds myriad risks that encumber the market's potential - the most prominent of which are the rigid labour market structure including potential strikes and the threat of terrorist attacks. In addition, the utilities networks face capacity limitations, particularly for water and electricity, which can disrupt business activity. ARABCCI was established in Hong Kong 2006 as a leading organisation at promoting commercial ties between Hong Kong/Greater China and the Arab World. Citizens from Bahrain, Hong Kong, Kuwait, Macao, Oman, Saudi Arabia and the United Arab Emirates can enter without a visa (for periods of up to three months).